Polyamide 11 (PA 11) or Nylon 11 is a polyamide bioplastic and is produced by Arkema under the trade name Rilsan from castor beans. Pebax® stands for polyether block amide. This high durability thermoplastic elastomer, is partially made from non-edible renewable resource, castor oil. Pebax® is plasticizer free and belongs to the engineering polymers family. The Pebax® range enables to bridge the gap between thermoplastics and rubbers. Pebax® Rnew is made up of block copolymers consisting of a sequence of polyamide 11 and polyether segments. It can be used pure, as an additive or in blends with other polymers or rubbers. It can also be reinforced with various fillers. Nylon 11 has been produced from 11-aminoundecanoic acid. 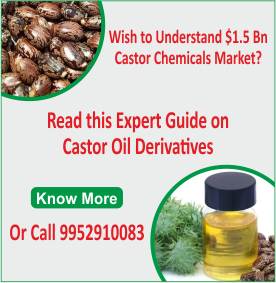 Castor oil is converted to methyl ricinoleate by treatment with methyl alcohol. Methyl ricinoleate is pyrolysed at high temperature yielding heptaldehyde, methyl undecylenate and a small amount of fatty acids. Methyl undecylenate is hydrolysed to produce undecylenic acid. When undecylenic acidis treated with hydrogen bromide in a non-polar solvent in the presence of peroxide, reverse Markownikoff addition occurs and the main product is x-bromoundecanoic acid. This is then treated with ammonia to give x-aminoundecanoic acid, which is a crystalline solid. Aminoundecanoic acid is the starting material for nylon-11. Compared to its predecessors, Nylon 6, 6-6 and 6-10, Nylon 11 has the lowest melting point, lowest specific gravity and the lowest moisture absorption. It is also resistant to acid and alkaline reagents or oxidizing agents. These qualities of castor oil are of particular importance in its use in high quality engineering plastics and in durable protective coatings. BASF produces Ultramid® BALANCE, a polyamide 6.10. This is based to the extent of about 60 per cent on sebacic acid, a renewable raw material derived from castor oil. This established and now revitalized material, combines product properties such as good low temperature impact resistance with a relatively low density for a polyamide, which in automotive construction, for example, allows savings in weight, associated costs and emissions. In Apr 2010, DSM Engineering Plastics launched EcoPaXX™, a bio-based, high-performance engineering plastic. EcoPaXX™ is a long-chain polyamide whose properties make it suitable for demanding applications such as those in the automotive and electrical markets. Approximately 70% of the polymer, consists of building blocks derived from castor oil as a renewable resource. The new material, which is based on polyamide (PA) 4,10. EcoPaXX™ is a high-performance polyamide with excellent mechanical properties. It combines the benefits of a high melting point of ca. 250oC, with a high rate of crystallization enabling high productivity. The material has low moisture absorption and excellent chemical and hydrolysis resistance, which makes it highly suitable for various demanding applications, for instance in the automotive and electrical markets. The company is targeting auto industry with the new bio-based performance materials in response to demand from auto customers for more environmentally friendly materials.